Last summer I took a bold step with my fictional writing when I gave my heroine the gift of poetry as one of her traits, and then included short verses in my novella proposal for Love In Store. The theme for the novella collection was secret admirer, and my submission included a page with the verses that would be scattered throughout the story in the form of love notes. I say it was a bold step to include the verses because poetry is not my strength. I write rhyming, metered verses as the mood hits me. For instance, I wrote a poem after visiting the Oregon Trail ruts in Guernsey, Wyoming because the experience touched me deeply. As I stood there imagining the pioneer scene, I could hear the cracks from the whips, the babies' cries, and the mix of emotion-filled voices. Driving away, the poem fell into place, and now when I read, You Were By My Side, I'm taken back to that memory of memories. I'm adding other poetry to my website as my courage dictates so I can't tell you how I had the nerve to include it in my novella submission, but to me it fit. And I was blessed abundantly when Barbour Publishing chose to include my story as one of 9 novellas in The Secret Admirer Romance Collection. On the right is the bookmark I created as a visual reference of the love notes in Love in Store since they are an integral part of the story. Each love note contains a verse with two lines of poetry which the heroine, Janet, hides among the items and shelves of hero Adam's store. At one time I had thought to write all the notes based on verses from Song of Solomon, but . . . well, have you read that book of the Bible? Suffice to say I chose one reference to it and the rest are my own words. My goal was to start with a casual reference, and then say something more - emotionally and physically deeper - with each verse. Over time Janet allows her true feelings to play out on the floral paper until she bares everything to Adam . . . except her identify. Adam's goal is to be left alone because he has problems that he doesn't want to share. 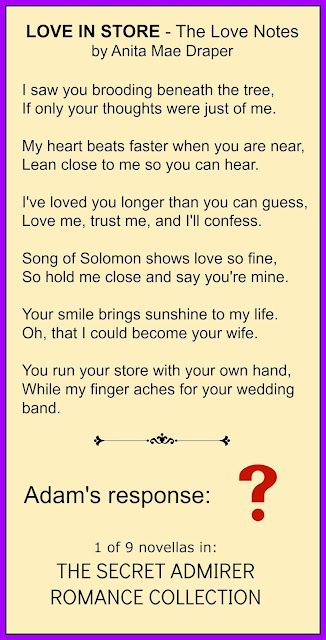 When Janet's final love note is revealed, Adam responds with a short poem of his own, but you'll have to read the book to discover his answer, hence it's not included on the bookmark. For those of you who can't read the tiny words on my bookmark, here's one of the pins on my Novella: Love in Store Pinterest board. The bookmark and matching postcard (shown below) are being sent as a thank you gift to my newsletter subscribers who gave a postal address when they signed up or since then. If you're not on my mailing list and don't wish to receive my newsletter, but still want either the bookmark, postcard, or both, let me know through my website contact page. The Secret Admirer Romance Collection will release May 1st and is available for pre-order at 46% off regular price through amazon.com (not .ca). If you'd like to take a chance on winning a copy, I have several blog appearances starting in about 10 days where I'll be giving away print copies. I also have some goodies lined up in a special Secret Admirer Prize Pack. Keep informed through my Contests & Giveaways page. Using my poetry in a story isn't something I planned and prepared for, but I'm so very grateful that God gave me the gift, and then put the idea into my head to use it to enhance Love in Store. I'm especially honored that Barbour Publishing chose my story with its simple verses for this collection. And do you know what else? I really like my story. I hope you do too. Question: Do you write poetry, either verse or prose? What about haiku? Or . . . you tell me. Giveaway: I haven't received my author copies yet, but since I advertised it on my website, I'm giving away a copy of The SECRET ADMIRER Romance Collection in conjunction with today's post. If you want a chance to win it, leave a comment before Sunday midnight April 23. I'll pick a winner on Monday morning and send the winner a print copy when I receive them. P.S. The postcard looks dinky here but really is a regular postcard size. So excited for your new release, Anita! Can't wait to get the book. By the way, the art department did a stellar job with the cover. One of their finest! It's beautiful. Really, Susie? If you told me that before I've forgotten. That sounds like a wonderful way to spend a summer. Yes, this cover is beautiful and really inspired me in the creation of my bookmark and postcard. So easy on the eyes. Wow! This looks amazing! Already on my TBR list for sure! I'm loving this cover. Ditto to Susie's comment on the stellar job on that cover. Just gorgeous and that postcard. Thanks, Deb. I hope I get another chance to write for Barbour, too. I really enjoyed the 2 novellas I've written for them in these multi-author collections. Between your grandkids, writing, and work, it's a wonder you have time for sewing never mind poetry. You're amazing to do all that you do as it is. 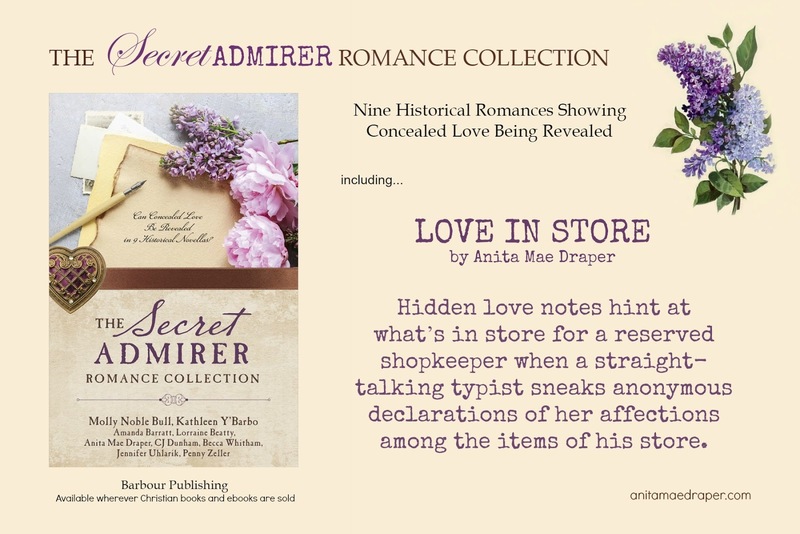 I am so glad to be a part of The Secret Admirer Romance Collection, nine novellas by nine different authors, and it is an honor to call Anita Mae my friend and fellow author. Way to go, Anita. Love, Molly Noble Bull. Thanks, Molly, but the honor is mine. I started reading your stories when you wrote for Love Inspired. I'm pinching myself to see us on a cover together. :) Thanks for supporting me by visiting here. I so enjoy reading novellas because there are so many great stories and authors all combined into one book for ones reading pleasure. I love this theme! I fumbled around and produced something resembling poetry when I had to in school, but haven't written any since then. This sounds like a great novella. I really like your writing and the poetry sounds like a great twist! All the best! Elise, you sound like me and singing. Love to sing, but it's better all around if I do it in my head. teehee. I'm a hideous poet, but I think it's SO cute that included this for your heroine. I'm dying to read your story and find out his answer. DeAnna, I'm very glad God spread His gifts around because you have enough creativity in the quilting and writing department. Aren't you a crit cut craftie too? Congratulations, Elise! An email looking for your postal info will head your way shortly. Thank you everyone for stopping by, and keep an eye on my website contests and giveaway page for all the news.